Hillary Clinton sure is lucky that Bernie Sanders stayed away from the email issue (and otherwise avoided going for the jugular during the primaries), and faces a candidate so awful in the general election that people aren’t paying much attention to her rather major faults. After being chastised by the fact checkers for lying about the email scandal again last weekend, she repeated the same lies. After months of failing to make herself available for a press conference, as Chris Cillizza wrote, Hillary Clinton tried to answer questions about her emails. It didn’t go well. She repeated the same lies which have already been debunked. This is by now a very familiar pattern with Clinton when it comes to her email server. She simply refuses to acknowledge any misstep or wrongdoing beyond an initial poor decision to exclusively use a private email server for “convenience” sake. She continues to provide legalistic answers that touch the truth but aren’t entirely the truth. As I have written many times before, a campaign is not a court. Public opinion is a different thing than the law. Clinton has never grasped and seems to still not grasp that. Her ongoing poor handling of the email issue may not matter because she is running against someone in Donald Trump who has proven uniquely unable to keep the spotlight off of him. But it suggests that if Trump could ever get his act together, Clinton still carries considerable vulnerabilities as a candidate. Despite the lies which Clinton keeps repeating, presumably believing that if she tells them enough people will suddenly think they are true, James Comey’s statement demonstrated several lies on Clinton’s part. In addition, the State Department Inspector General report showed that Clinton knowingly violated the rules in effect regarding email when she was Secretary of State, failed to cooperate with the investigation, and tried to cover-up her actions. Clinton’s misbehavior of Secretary of State would prevent her from being from being confirmed for any appointed government position, and would prevent her from being hired for any government position which requires security clearance. Being elected president is not subject to these considerations. It is disgraceful that the Democratic Party would make her the nominee with her record. In any normal election year this would also prevent her from being elected, but with Donald Trump her opponent this is no normal election year. Posted in Bernie Sanders, Donald Trump, Hillary Clinton, Politics, Scandals. Tags: Bernie Sanders, Donald Trump, Hillary Clinton, Politics, Scandals. RSS feed for comments on this post.. TrackBack URL. I'm sorry, but what is the purpose of your attacks on Hillary? Are you trying to get her to drop out, to give up? Are you trying to get people to not vote for her? Neither is going to happen with the current climate. Even if they did, what is your alternative? Trump? Johnson? Stein? Clearly the first is someone that shouldn't be in the White House. You could almost argue for Johnson, except he's less liberal then Clinton and would certainly try to undo democrat efforts over the last 8 years. Stein is a pseudo-anti-vaxxers who believes that wifi signals affect the brain and seems more willing to put Trump in power then support Hillary by offering Bernie the Green party spot (which would only have a Nader level affect on the election). So what is the goal of your relentless attacks? What do you hope to accomplish with your anger and hatred? I understand that Hillary isn't the Democrat you want, but it's the Democrat you have. It's not that you shouldn't point out her flaws, but it seems your hatred of her has made you blind to the very real threat that having someone like Trump win the presidency. It appears you favor the Fox mode of covering politics–ignoring the facts and base reporting on partisanship. Here we have a candidate who committed major ethical violations, and then has lied to the American people about it for over a year. Which party she is in and who she is running against is totally irrelevant to this. poor benjamin. you think you like hillary can say wht you want abt others in such a demeaning tone and we are to accept it? why not hitller besides her stealing an election? 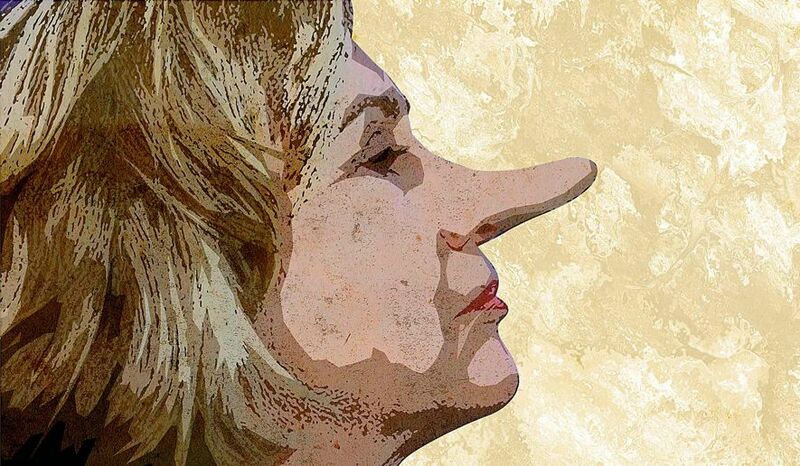 she is pro monsanto, pro tpp, pro frackin, pro corporations, and she lies when she does not need to. tht is just to start. Oh, Ben, Ben, Ben, I hear your mother calling. Go on home and leave the electing a president to people who are capable of making the right decision by voting their conscience. I'm well aware of the history of Hillary Clinton. She is a politician who has made a lot of good decisions and plenty of bad decisions. I would rather have a better candidate, but right now it's either her or Trump. Neither Stein or Johnson are truly viable as candidates, nor do I think either would be up to the office. I also dislike having a two-party system, forcing people to choose the lesser of two evils, but that is the system we have. You should vote your conscience, but I also remember 1992 when Ross Perot potentially shifted the election to give Bill Clinton the win; or in 2000 when Ralph Nader pulled just enough votes in one state to give us 8 years of George Bush. Voting your conscience may make you feel better at the end of the day, but can have lasting impact that your may not like. As I said, you should point out her flaws and actions, but the fundamental question remains, what are you trying to accomplish? She has made plenty of bad decisions–pretty much every major decision of her career. Few good ones. There are multiple flaws in the Nader argument. The argument was already weak in 2000 when exit polls showed that Nader votes were split and would not have gone to Bush, and that more Democrats voted for Bush than votes lost to Nader. The argument is even weaker now when it is Hillary Clinton who is the George Bush candidate this year. With Clinton supporting so many of the policies of Bush, it makes no sense to use the awful consequences of the election of George Bush to support Clinton. With this blog I am trying to accomplish providing honest news and commentary on politics–not covering up the facts to support one candidate based upon their party. Plus presidential election years are when the most people are paying attention to politics. With both political parties nominating a right-authoritarian candidate who are both wrong on the issues, promoting third party candidates is the best way to promote alternate views. Whether or not the third candidate can win is not relevant to this. Neither Stein or Johnson are up to the office? You are saying that a neocon warmonger such as Clinton or a buffoon such as Trump are any more qualified? They are the two least qualified. Even if we look at more traditional experience, Gary Johnson is certainly far more qualified than Hillary Clinton considering what a failure she has been throughout her political career. (Of course, while Johnson is the most qualified candidate running this year, I’d vote for Stein due to the differences in their views). One of the most disturbing things about Hillary is that she represents an incipient dynasty. I can imagine, 40 years from now, one of her grandchildren running for high public office, if the machine that has propelled her this far into power remains functional. Or, God forbid, Chelsea in another 12 years. When a Southern politicians no longer holds his office, there's an old tradition of the wife stepping in after the funeral, the court sentence, or, in this case, the term limits. To say that such — the continuation of Clinton machine politics (especially given the nefarious roles of the Clinton Foundation and Initiative) — is some kind of triumph for women's rights is risible. This is outside of her having done nothing except accrue power, favors, debts to donors, and express poor judgement in her role as a public servant. Her whole profile is deeply disturbing. Nevertheless, we may be stuck with her as President, as we may be stuck with Trump, and we have been stuck with Nixon, Reagan, and son of a Bush, who were by turns mendacious, ideologically bankrupt, and Quixotically nefarious. This election, there's every reason to vote for a third party. Your vote won't determine the election, at most it could trigger a move from the electoral college to the house as the deciding venue. But it will signal to others so minded, and to the nation, that the desire for change has manifested itself. The exit polls in Florida had a sample size of 1,829, of which 30 were Nader supporters. Such a small sample size doesn't provide any meaningful extrapolation. Subsequent ballot level analysis of the ~3 million ballots indicated that the the split in Nader voters would have been 60/40 Gore/Bush [http://www.sscnet.ucla.edu/polisci/faculty/lewis/pdf/greenreform9.pdf]. Given the 537 vote difference between Bush/Gore, this indicates that Nader supporters allowed Bush to win Florida. I'll concede that Johnson has the potential to be a President given his experience. Where I see the problem is that our current government is antithetical to the libertarian mindset and that any existing laws that are "not in the Constitution" will be attacked by an Republican congress, Libertarian executive, and soon-after-the-election conservative judiciary branches of government. The reality of the situation is that the two party system requires that people vote strategically. It's about who gets the 270 electoral votes, not who gets the most popular vote (*cough* Gore *cough*). There is no do-overs in presidential elections. A vote for Stein or Johnson may ease your conscience, but it will ultimately make it easier for the person you don't want to win the election. That said, if you honestly don't see a difference between Clinton and Trump, then vote for a third party candidate. I see a difference and that makes my choice this election easy. Gore lost far more votes to Democratic voters voting for Bush than from the ones he lost to Nader which he might have won. Plus even if it was the case that Nader cost Gore the election, many things are different this year than in 2000 and the 2000 election cannot be used to forever rule out consideration of third parties. Doing that will just allow the major parties to continue to get worse. The reality of a two party system is that views expressed become limited, and one way to get other ways expressed, and potentially influence the major parties in the future, is through supporting third party candidates. We also have an unprecedented situation this year with both major party candidates being so awful, with such large numbers of people opposed to both, and with an unprecedented number of people not being affiliated with either major party. While I disagree with Johnson on a number of issues, there is nothing in his mindset which prevented him from being governor of a state, and there is also nothing preventing him from being a president. Of all the states that Gore lost in 2000, Florida was the only one where Nader's votes would have changed the results. When Gore lost Florida it cost him the election. Gore may have lost the election, but it was Nader who handed the presidency to Bush. This is an odd election. And it shows the main weakness of the two party system. The founders never planned for people having to choose the lesser of two evils. Of course they thought that Vice President would be the runner up in the electoral college and well that never worked out. They weren't perfect and neither is our system. But it is the system we have. Again, if you really don't see a difference between Hillary and Trump, vote for a third-party candidate and hope for the best. The amount of votes which Gore might have picked up if Nader wasn’t running was tiny. The election was lost due to Gore failing to stand for anything while running, causing many Democratic voters to refrain from voting for him. There were many factors involved, also including the butterfly ballots and mistaken votes for Buchanan, and the undercount for Gore statewide which would have given him the election. It makes no sense to concentrate on only one factor and use this as an argument against supporting third party candidates in other elections with completely different circumstances. It certainly makes no sense to use 2000 to justify voting for a neocon like Clinton. The issue is not whether there is a difference between Clinton and Trump but the consequences of allowing the major parties to nominate any candidate, regardless of how terrible. I haven’t seen the movie so I can’t really comment on its accuracy, but I would sure be wary of anything coming from Dinesh D’Souza. If Nader hadn't been part of the election, that would have freed up 90,000 votes to split among the remaining candidates or not vote. That's hardly tiny and assuming the 60% number from the study above is accurate, would have been more then enough to swing Gore into the lead. You are right in that Gore had a host of issues wrt to Flordia, but as I said, Gore lost the election, but is was Nader who handed it to Bush. It seems simple to me. I live in a very partisan state, so my vote carries little weight. I can issue a protest vote knowing that the the lesser-of-two-evils will win my state regardless. But if I were in a swing state like Florida or Ohio, I'd think carefully about my vote because it has a larger effect then just me. It sets the next four years on a path I might not like. The next President is going to be able to nominate at least 2 supreme court justices, possibly more; decide the fate of the ACA, the refugee crisis, environmental policy, and a host of other issues that will have a lasting effect on US culture. You may see Hillary as the "George Bush" of this election, but who do see Trump as? That all said, I think it's time for me to go back to lurking. Thanks for tolerating my ramblings. The reality show star pretending to be a presidential candidate. He is a rather unprecedented character.